The Sport Aircraft Builders Club was formed in 1973 by a group of ordinary people interested in aviation and aircraft building. Over the years club members have built up a facility second to none at Serpentine Airfield. Members build, hangar and fly their aircraft at Serpentine, and join in the many social events (flying and non flying) that help make it such a great club. If the web site sparks your interest, contact us and arrange a visit to the airfield for a look around. The Club was established to provide a base and airfield for members to build, restore, maintain and operate their aircraft. Members participate in a wide range of activities including fly-ins, fly-aways, competitions, maintaining the airport infrastructure and other social activities. 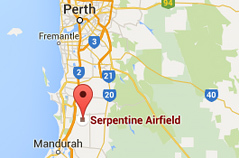 Serpentine Airfield is restricted to Sport and Recreational aviation only; no commercial flying.